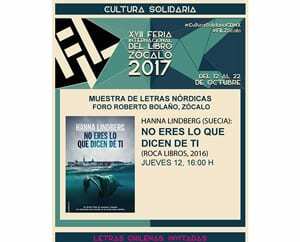 Book Presentation: Hanna Lindberg, No eres lo que dicen de ti (Roca Libros, 2016). With the author and Raquel Castro. Dates: 12 – 22 October 2017 at Zócalo – the mail square in Mexico City.